" Larry discovered the interesting feeding behaviour in Sciaenaochromis fryeri "
In January 2003 Cichlid News Magazine published Larry’s article and pictures on the genus Mylochromis. Larry also discovered the interesting feeding behaviour in Sciaenaochromis fryeri and photographing for the first time a new species of Lethrinops sp.”mbenji round-head” and Otopharynx speciosus at Nkhomo Reef. There are a few of Larry's pictures in Ad Konings 4th edition of Malawi Cichlids in their Natural Habitat. Larry also contributes time as a moderator on several forums and is a contributing photographic author to The Cichllid Companion Room and Buntbarsche Bulletin for the ACA. 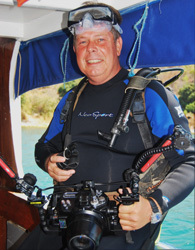 Larry spent two months in Malawi (2009) installing Anti-Netting Devices around the Maleri Islands and conducted a Cichlid Survey in conjunction with the Stuart M. Grant Conservation Fund. In September 2014 he will travel to Lake Malawi for the 14th time. Larry does a few different talks but is mostly asked for, Swimming with Cichlids (updated yearly), or the most recent Lake Malawi Safaris trip.